“Know then that it is those of faith who are the sons of Abraham… . So then, those who are of faith are blessed along with Abraham, the man of faith” (vv. 7–9). God originally promised Abraham that He would make the patriarch great, give him many descendants, and make him the agent through which all the families of the earth will find blessing (Gen. 12:1–3). Old covenant Israel never saw these promises kept in their fullness, largely on account of the nation’s failure to be a light to the nations. Rather than pointing the Gentiles to the one, true creator God and His holy ways, most Israelites “walked in the customs of the nations whom the Lord drove out before the people of Israel” (2 Kings 17:8), prompting God to cast the nation out of their land. 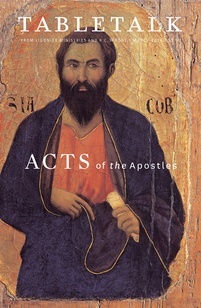 But out of His great mercy and fidelity to His covenant with Abraham, the Lord called a faithful remnant to remember the patriarch and how he saw God do what is impossible for human beings, encouraging them to look for Yahweh to act similarly in the remnant to keep His promise to bless the earth (Isa. 51:1–5). As individuals like Mary and Zechariah recognized, God moved in Christ Jesus to bring His covenant with Abraham to fulfillment (Luke 1:46–80). And as the apostle Paul explains in today’s passage, it is through faith alone in Christ Jesus that the families of the earth find the blessing God pledged to bring about through Abraham and his descendants (Gal. 3:7–9). What is most remarkable about Paul’s teaching is that the people of the earth who trust in Jesus enjoy this blessing not as outsiders but as full members of the Abrahamic family. The old covenant prophets were always clear that God’s salvation would touch every nation, but what is clearer to us under the new covenant is that people from every nation are not second-class citizens in the kingdom of heaven but are incorporated into the Israel of God — that group of people who trust in Christ whether they are of Jewish or Gentile heritage (v. 29). Martin Luther comments on today’s passage: “We also, if we will be delivered from our sins and be saved, must take hold of the justifying and saving Christ, whom Abraham also by faith did apprehend, and through Him was blessed.” Deliverance from the penalty and the power of our sins is but the first of the Abrahamic blessings we enjoy if we trust in Jesus. For we too will be inheritors of a good land that includes not only Canaan but a “new heavens and a new earth in which righteousness dwells” (2 Peter 3:13). Apart from Christ we were without hope in this world, but in Him we will inherit the very best our God has to offer. Understanding this truth should make us long for the day when He returns to consummate His plan and usher in the eternal state wherein we will live before the Lord without fear — forever. Do you long for the transformation of the world and the redemption of your body more than the comforts of this present age?